When I studied journalism at this State University institution, it was a two-year landing that went by the name Morrisville Agricultural and Technical College. 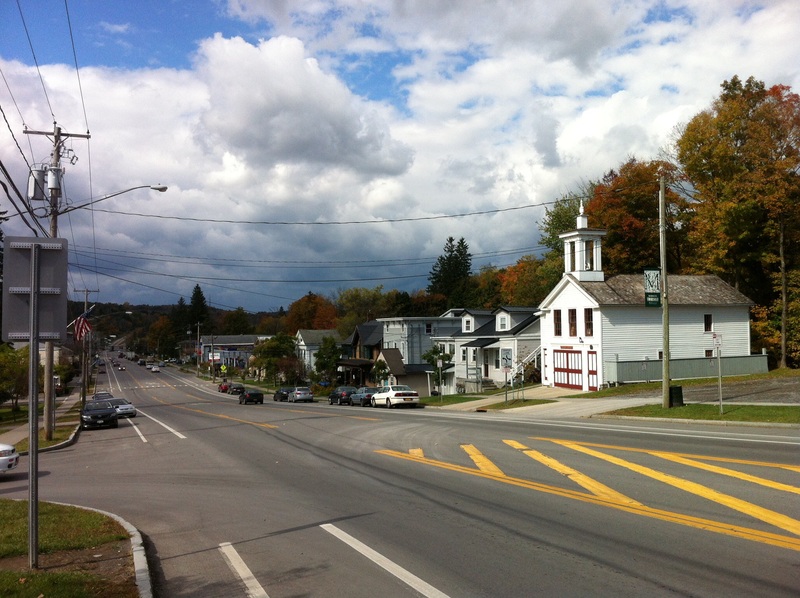 After driving those 35 miles east of Syracuse to pick up my monthly collection of meds from my friends Jen and Chris at Doughterty Pharmacy this week, I was struck by a familar feeling as I climbed out of my car, moved to walk up and down the half-mile strip that makes up the town-and-gown front of Morrisville, N.Y., on U.S. Route 20, to soak it in. Fall feels fallier in this part of the world. Autumn is more awesome. Only 45 minutes out of Syracuse, the leaves have more color, the air is crisper, and everything smelled a little different. New York Pizzeria at lunchtime or wood-burning stoves already on duty? Students and villagers alike share this striking view of the Cherry Valley, bisected by Route 20. I have a long and winding history with this village. I first came here as a wide-eyed teen, fresh out of a Long Island high school in August, 1975. I spent the next two years studying journalism and learning they ways of upstate New York living, too, on the way to my associate’s degree. Still selling drafts, burgers and wings. My second year, a bar-and-pub-food joint by the name of The Fort opened on the far side of Route 20, closer to the campus than the cluster of the Cherry Valley Inn, The Place, The Town House and The Shamrock down the hill. It became very popular, with a Thursday night line becoming a tradition. 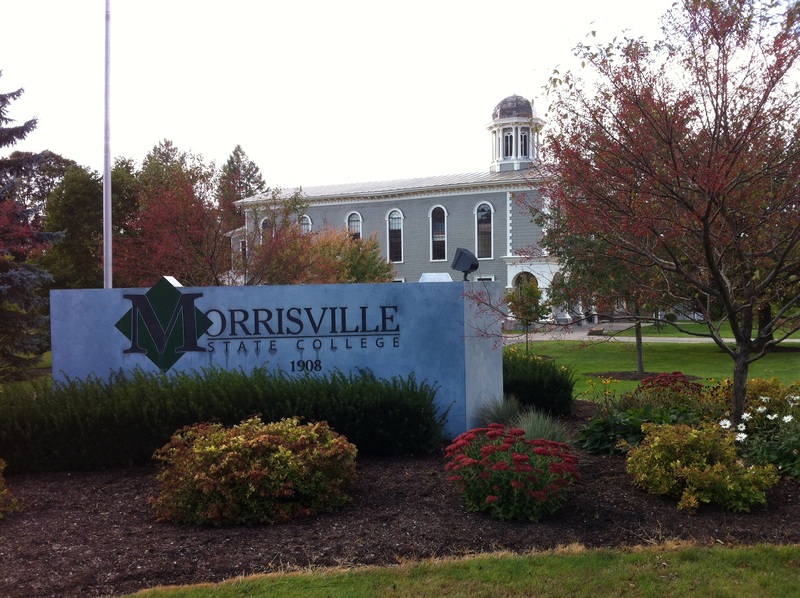 On Friday and Saturday nights, you see, a good portion of those who lived relatively close to Morrisville went home, leaving the town and campus to downstates and villagers. In the last decade of the 20th century, I became one of those villagers. Call it Mark and Morrisville Part II. After getting that Associate’s Degree and then my Bachelor’s from the University of Maryland at College Park and working for four years at a suburban Maryland daily, I took at job at Syracuse’s morning newspaper. After a few years of wearing the job blinders, I was introduced to a woman who lived in Madison County. We married and bought a house across Route 20 from Morrisville College. This is the house to which her mother and I brought our darling daughter Elisabeth home to from the hospital. Subsequent owners have done it justice. The Morrisville schools educated my dear daughter Elisabeth quite well. I enjoyed attending every school concert, every little league game, every school game. It was a fabulous corner of the world for her to grow up. Every book you’d need in a little space. She and I would walk down to the village library just a couple hundred yards away, and she’d smile to take out her card and borrow a new batch of favorites as our next door neighbor checked her out. And that kind woman’s husband played harmonica in a blues band as his night-time passion even when I was sports editor. Then I became the music writer. How’s that for foreshadowing? Though that old house and I were a mismatch, good times were had by all the Bialczaks in the village of Morrisville until they weren’t. 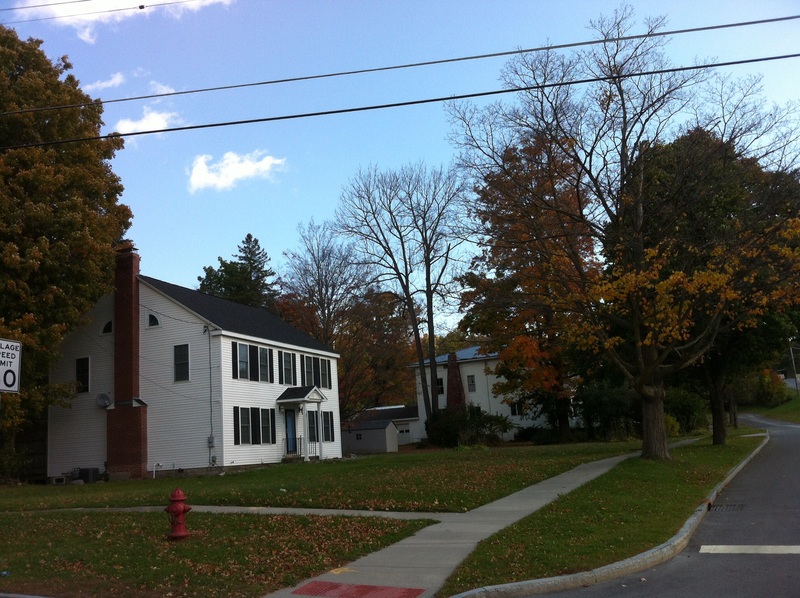 Leaves are down in Morrisville, N.Y.
Now I smile when I drive to this village, happy to think about the college years and the child-raising years and how welcoming Morrisville can be. Do you have a favorite used-to-live place where you return frequently, and if so, how does that make you feel? Is there a spot nearby where the seasons seem to change more quickly, and if so, why do you think that is? Have you been able to turn a sad ending into a better place in your mind? Oh Mark, a lovely wistful glance back in time. That library is just the most charming I’ve ever seen. I would be in there regularly, I know. The mental conversion of sad endings into something better, as you note, is tricky business and well worth the effort. This downstater LOVES “where you used to live.” Thanks for the mental trip (and the pics) back in time! Jimmy, isn’t it amazing how much things can change AND stay the same at the same time? The journalism anniversary bash will be here before we know it. I miss you, my friend. I hope things are well. Go Islanders. And go islanders. i love this village, mark. how wonderful that you can revisit it often and relive the good memories from that place, and let the hard ones go. interesting, my place is ann arbor. i used to come here since i was a little girl, to michigan games with my dad, and never went back much until graduate school at 40, and it felt like the place that was home and i knew i would find a way to stay. Nicely done, Mark .. Makes me want to take a drive there this weekend! It truly is a nice little campus and village this time of year, Jim. Just 10 miles farther than Caz, just before the far more rustic combo of Colgate and Hamilton. Memories. It is a beautiful town Mark. Humans never cease to amaze me – after all that little town is just the sum of all the individuals that are there and all that have ever been there. And they created that warm, open, beautiful town. It feels like a Rockwell print, doesn’t it? I’m sorry your memories ended badly there. I don’t have a “special” place. The first home I remember, my Dad built when I was 2 yeras old and we lived there for 6 years until work transferred him. I’ve gone back to visit once and it did not seem the same at all. Of course the whole neighborhood had changed as well – from a semi-rural setting to subdivision. Turning sad endings into better places – I’m not good at that Mark. Intellectually, of course, I can understand but that doesn’t effect my emotional reaction. And the only thing I have managed to do is passive – wait as time goes by and the emotional pain lessens. I know that’s not much help. Well, my friend, here it is Thanksgiving on Monday so the fallen leaves seem a part of the magic of seeing family and eating big turkey dinners followed by a scotch by the fireplace. Have a great weekend. You have a great weekend and enjoy your Thanksgiving turkey and scotch on Monday, my friend Paul. Work through the sad and find the better places in life, because it is more rewarding when that happends, in my humble opinion. A beautiful long and winding road down your memory lane, Mark. I sometimes visit Swampscott MA (my home town) and other places that have been important to me, often with Double Vision — seeing it through the past and the present. I think I work a lot at turning sad endings into better places. What helps me is recognizing that any ending is a construct — we’re all still in progress! Thanks for putting your constructs into my perspective, Ann. You are right. Progress and the past maked the double-vision return special. Love this trip down memory lane Mark and that village looks amazing. You know I love summer but this morning when I got up and opened the living room curtains and saw the fall colours and the leaves on the ground, I swear my heart smiled. Yes, fall can make your heart smile, too, Diana, and it often did for me in the village of Morrisville. Thank you for putting it exactly like that. Something about this time of year always brings my thoughts back to those two wonderful years in Mo’ville. Lots of memories. Special time of life. Thanks for the photos and reminiscing. The Fort still looks the same, does it not, Greg? Yes, fall was such a special time for us our two years as students together at Morrisville, my friend. Thanks so much for commenting here and making this post all that more special for me. Let’s raise a toast of milk from the carton, to sitting on the steps of Madison Hall together and eating sandwiches from Dean’s Deli or the Morrisville Market on a fall Saturday afternoon. I really enjoyed reading this Mark and viewing these lovely photos. 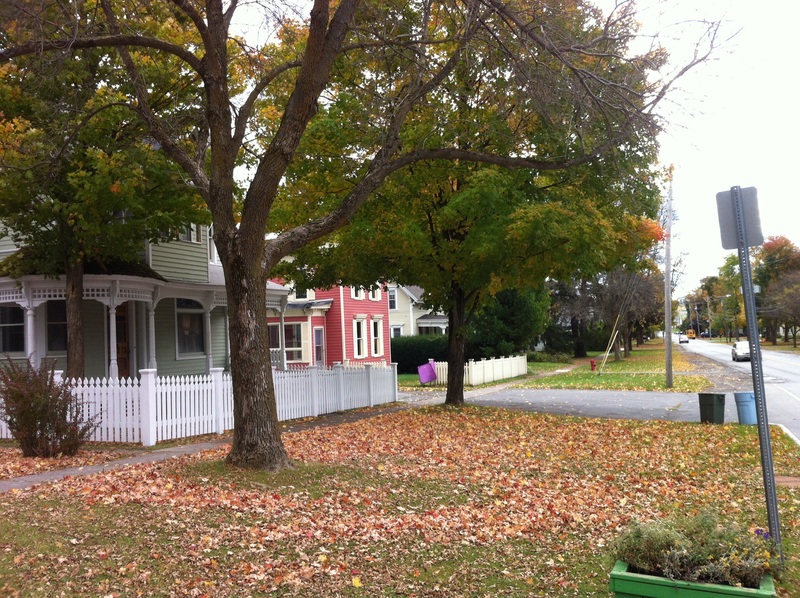 What a quaint little village, picket fences and autumn foliage and all. It looks kind and welcoming, a nice place to call home. It’s a homey little place, Kerbey. Close your eyes and imagine the smell of a wood stove. I too have fond memories of Mo’ville and my 2 years there. Met many “townies” that made it all the more fun. How could you go wrong in a place that had more bars than anything else! Oh, DJ, those bars made the ways you can go wrong plentiful sometimes, did they not? 🙂 But yes, it was a fine place for town and gownin’ for us, my friend. That’s a nice little slice o’ life, pallie. You’ve got some skills. Good to see that all that schooling didn’t go to waste. I love the charming village of Morrisville. Those old homes remind me of my early years in North Syracuse. What a wonderful college town to hang out in and then raise a family in. I love that it’s a “village”. I have fantastic memories of every place I’ve been. But the place I want to create and build is called “Ittakesa”. Which is probably why I am drawn to “villages”. This place to be has all of the things you just mentioned and more. What a lovely memory trip Mark. I love that the place you want to be is called “ittakesa,” Colleen. That’s perfect. This little place I happened to live in two separate and very different parts of my life happened to be in fact a village. That was very appropriate. I was glad to take you along on the journey. It looks clean and peaceful. Oneonta’s library was inside a house too. That makes good use of interesting architecture, I think, Kim. Such a wonderful picture of this town, you were a ‘villager’ in, Mark! I am so happy, you, Karen and Elizabeth had such a great experience, tons of ‘historical’ moments in your family life came about here, too. 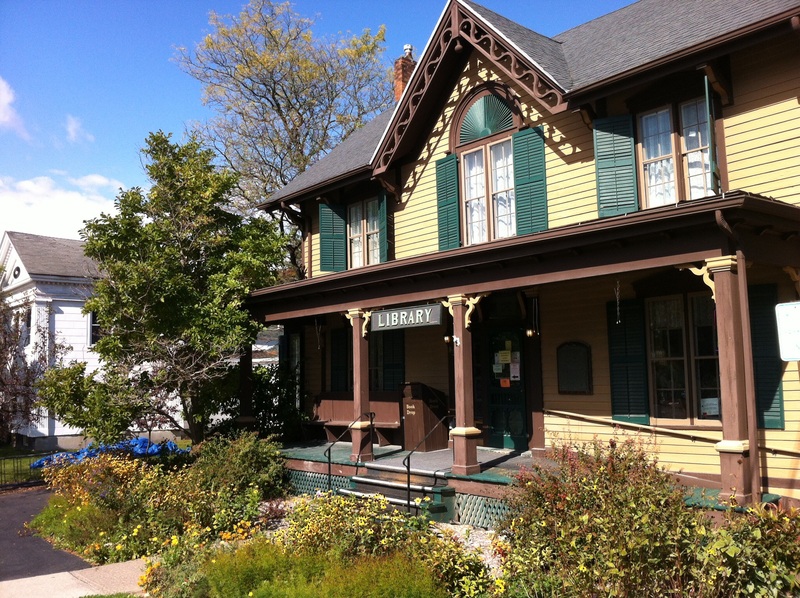 I liked the picture of your home, the library and the words you chose to share with us. 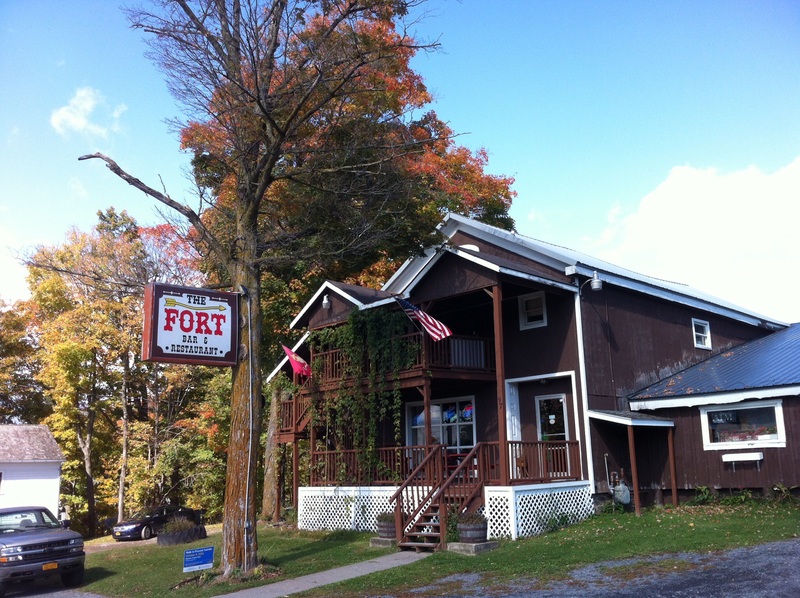 The “Fort” tavern was cute, the whole story was “Americana,” all the way! I like to go back to Sandusky, Ohio to see the small neighborhood where I went to elementary school, the Cleveland area, I have more chances to re-visit, revel in the middle and high school years, since both brothers, one sister in law and Mom live on the West side. I used to enjoy going back to BG, wish I had more chances to see my ‘college’ town and my good friend, Mindy there. Great post, Mark! What a lovely place for your daughter to grow up in. Loved reading this Mark. It’s good to be able to enjoy memories. Elisabeth still lives out that way, about six miles down the road where her mother moved, Rachel, and it is beautiful there, too, and they are happy in that neighboring village in the same county. You had a grand drive back this summer, so change can be acceptable, Red, right?! Indeed!! We have to enjoy the newness, Chum. I love this place! Seriously, you need to go right now and get a job for the Morrisville Chamber of Commerce because you definitely just convinced me to go there and probably want to live there. Like seriously, if I could pick up and move at this moment and cost were no factor, Morrisville (which I had never even heard of before) would be in the top five on my list of where to check out more thoroughly to move. It sounds so quaint and homey. And it’s beautiful! Thanks for sharing! Nowadays, though, I bet you could live there and email in your articles at least most days a week. Yes, I was a library rat every single place I’ve ever lived, Liz, and I get the feeling you were, too. Yes, the smell of books handled through time, but more than that, the people through the doors, workers and visitors and the whole community with hopes and dreams. That’s what a library fuels, done right on both sides of the main desk. Wow, you have the knack of getting me going. Thank you for your astute comments, my friend.